Daniel Solander was the Crown Prince who would have been Linnaeus’ successor as professor, and also his son in law, but who left everything for honour and fame in England. Solander was a clergyman's son from Piteå and had Linnaeus as teacher in Uppsala. He was a good and promising student and he lived in Linnaeus’ home. There he fell in love with Linnaeus’ eldest daughter Lisa Stina. He called her ”my sweetest mamselle”. Linnaeus sent Solander to England to spread the knowledge of his sexual system. Solander was very well received in London and decided to stay there instead of going home. His decision might have been influenced by Lisa Stina's engagement to another man. Solander went on the first sailing trip round the world to the east, with James Cook as captain. Together with the English botanist Banks he explored Australia, New Zealand and the South Seas. The journey was a great scientific success. All animals and plants Solander collected were the property of Banks, so he could not send anything to Linnaeus who waited in vain to see Solander's collections. Linnaeus felt abandoned by his pupil who never sent him anything. Solander died suddenly after a cerebral haemorrhage at the age of 49. Unfortunately he never published his findings from the successful journey. 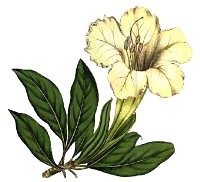 Today he is remembered by the beautiful plant genus Solandra with large sweet-smelling flowers. Solandra belongs to the potato family, Solanaceae.